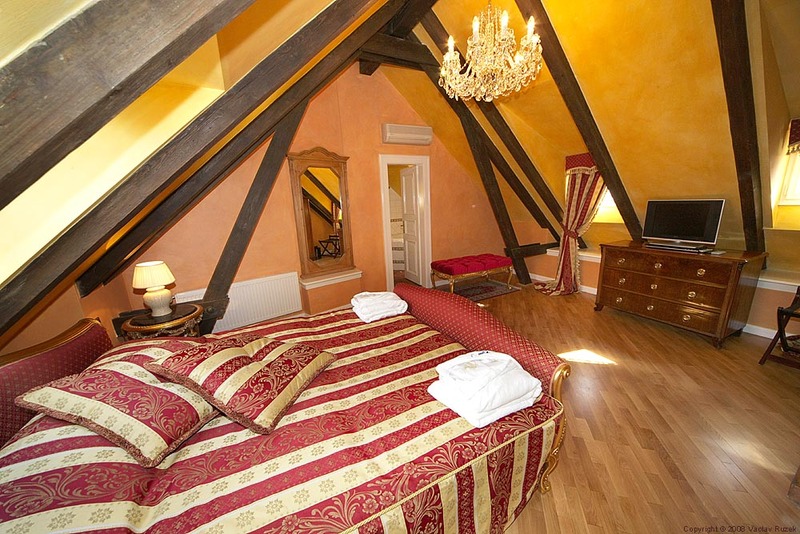 This is a historic 17th century Residence located on a small quiet cobblestone street in Malá Strana, or the Lesser Town, just two minutes from the famous Charles Bridge. 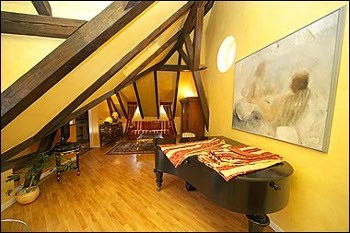 There are currently 15 rooms & suites available for long or short-term stays. Our aim is to provide those who appreciate the discreet charm of the past with all the benefits of staying in a deluxe apartment in the heart of our romantic city. 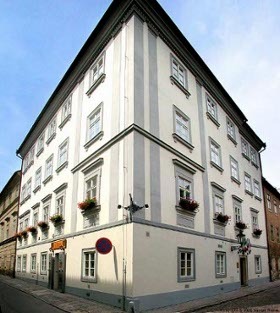 In order to make this possible we employed the aid of a number of well-known conservators of Czech churches and castles, as well as by skilled carpenters, plasterers, ceramists, decorators and fresco painters. These masters of their trade were all inspired by their love of Prague architecture and were aware of the need of great sensitivity and patience. 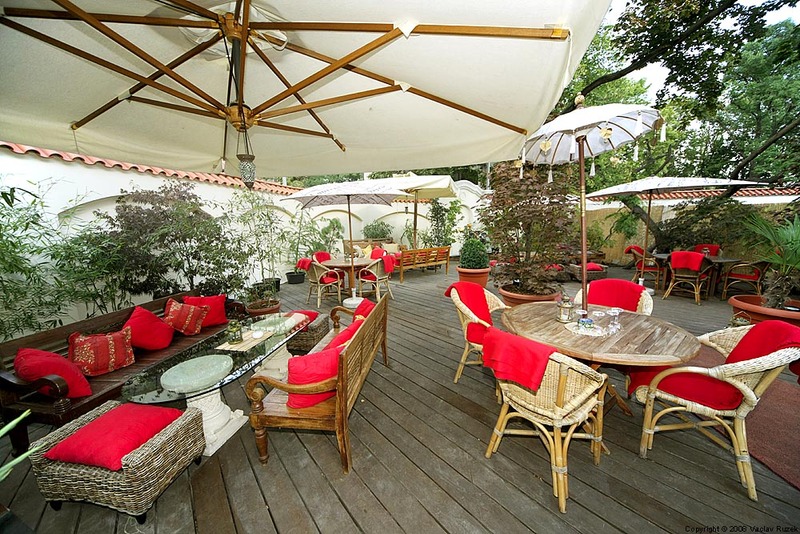 The Residence offers superb conditions for work or for relaxation. 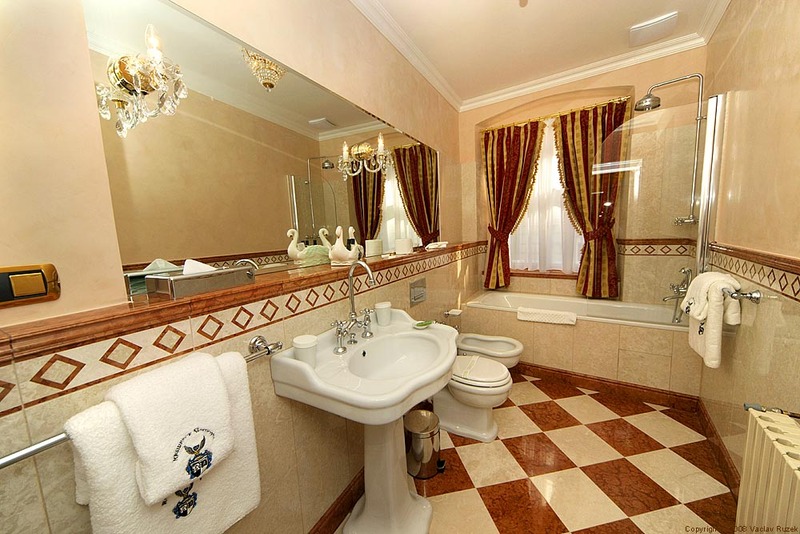 Each apartment has a nice marble bathroom, air-condition, minibar, LCD TV satellite, DVD & CD player, high speed internet access, direct dial telephone and safe. 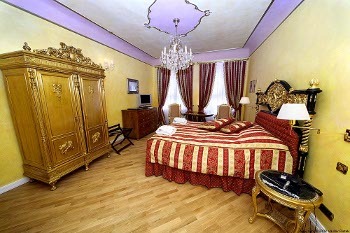 The rooms vary in size from 24m2 to 82m2. 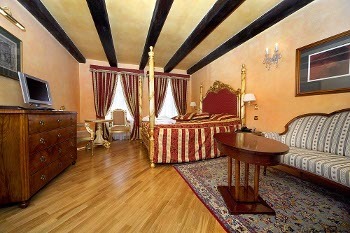 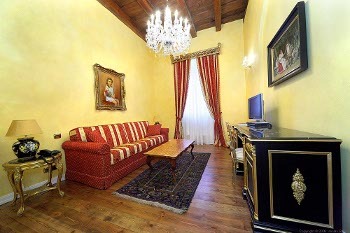 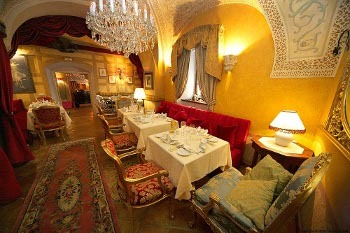 Each room is also decorated with works of art and antique furniture. We also have a full range of services available. 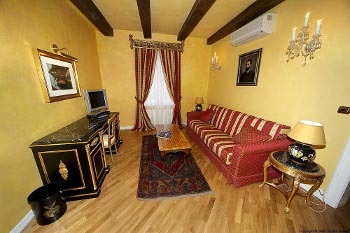 Guests have access to e-mail, fax, baby-sitting, laundry, room service, and private parking. 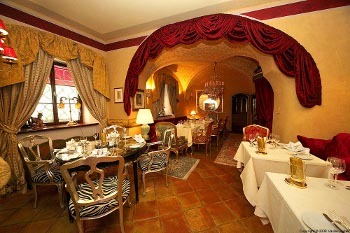 The staff are also willing to help you plan your evenings by arranging concert, theatre or film tickets. bedroom with a queen size double bed 160x200cm, marble bathroom with bath tub and toilet, air-condition, tiled floors, LCD Sat TV, DVD & CD player, high speed internet access, safe, for 2 persons, 25 sqm / 269 sqft, located on the ground floor. 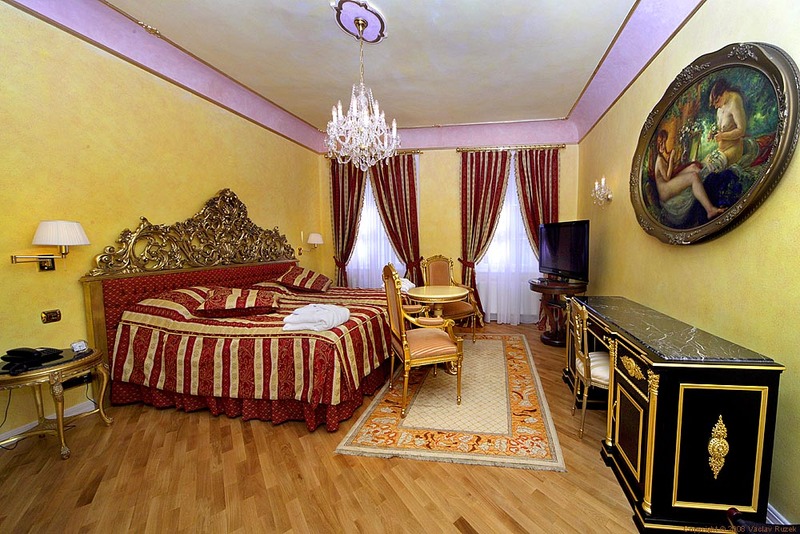 bedroom with a queen size double bed 160x200cm, kitchenette, marble bathroom with bath tub and toilet, air-condition, parquet floors, LCD Sat TV, DVD & CD player, high speed internet access, safe, for 2 persons, 39 sqm / 419 sqft, located on the first floor. 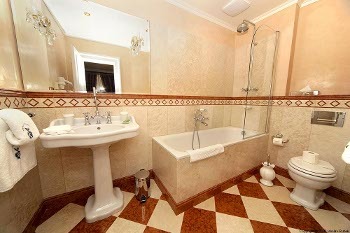 bedroom with a queen size double bed 160x200cm, kitchenette, marble bathroom with bath tub and toilet, air-condition, parquet floors, LCD Sat TV, DVD & CD player, high speed internet access, safe, for 2 persons, 37 sqm / 394 sqft, located on the third floor. 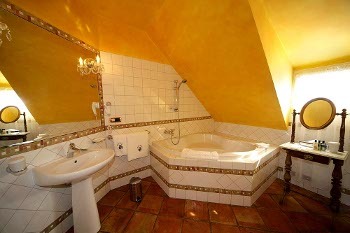 Alzbeta Pomoranska - no.416 - attic bedroom with a double bed, large bathroom with bathtub and toilet, common living room and kitchen with the second deluxe room. These two deluxe rooms can be connected to form a large two-storeyed attic apartment with 2 bedrooms, 2 bathrooms, living room and kitchen. 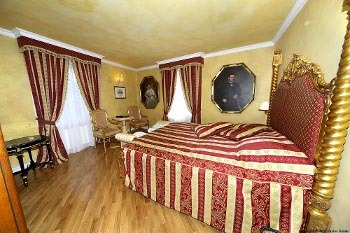 Arcimboldo - no.103 - bedroom with a four poster double bed, sitting area and kitchenette, bathroom with bath tub and toilet. 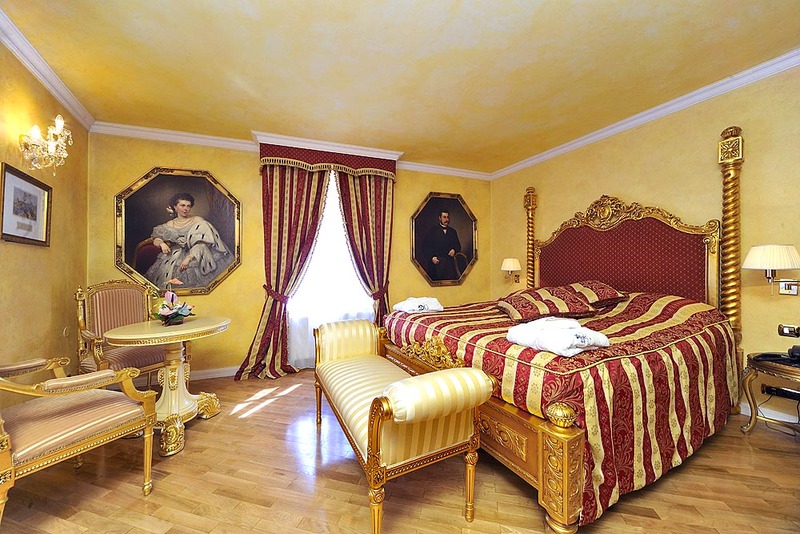 Rudolf II - no.105 - bedroom with a double bed, fireplace and sitting area, bathroom with bath tub, bidet and toilet, can be connected with Royal Suite De Brahe - no.106 to form an Imperial Suite with 2 bedrooms, 2 bathrooms and living room. 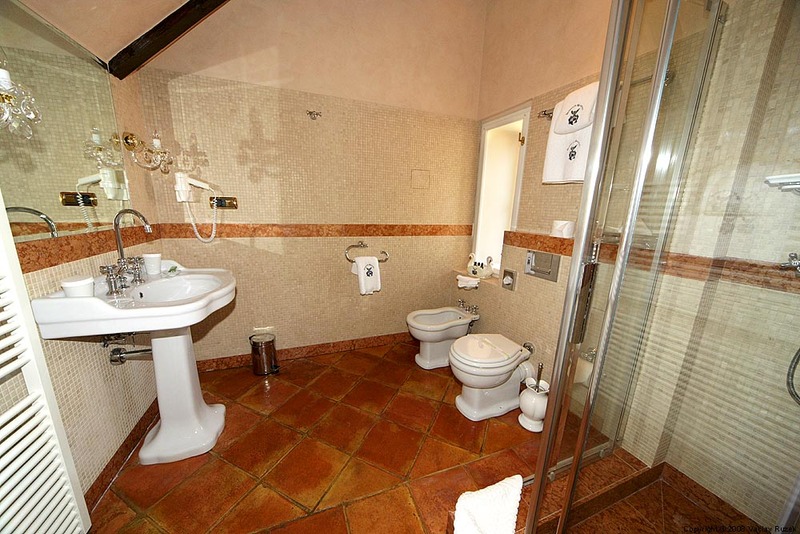 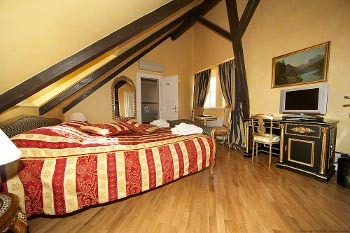 Marie Therese - no.207 - bedroom with two twin beds and sitting area, bathroom with bath tub, bidet and toilet. 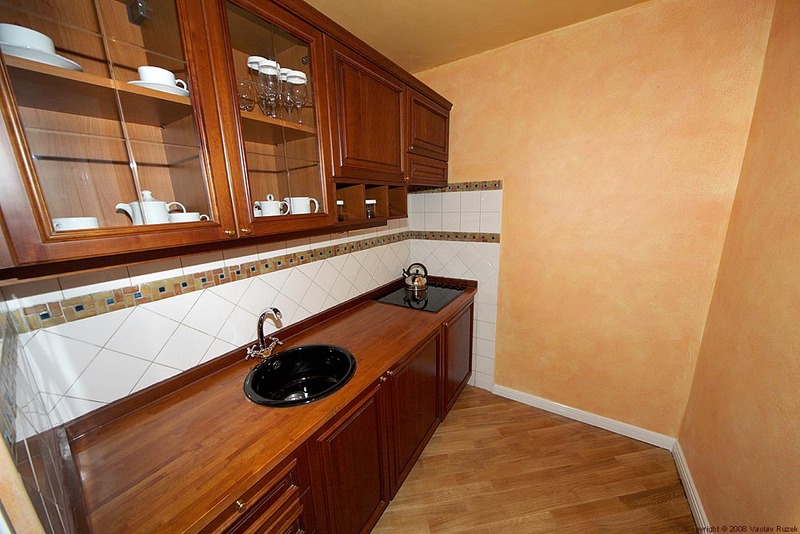 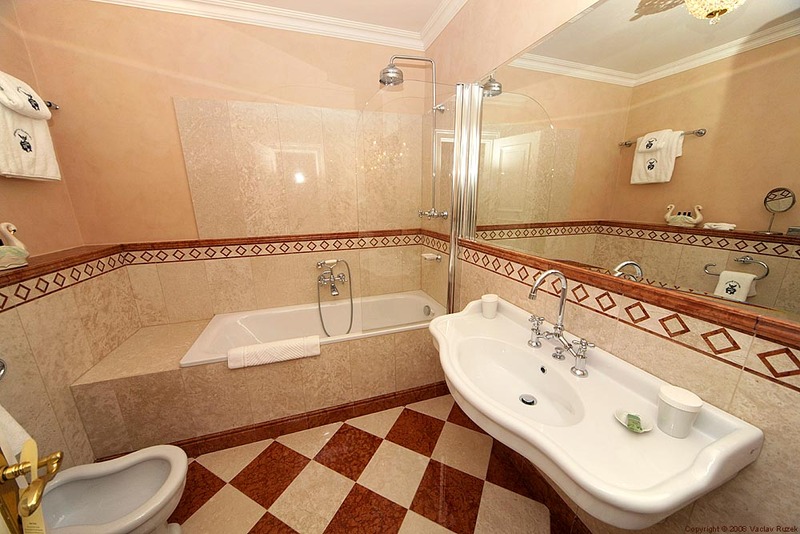 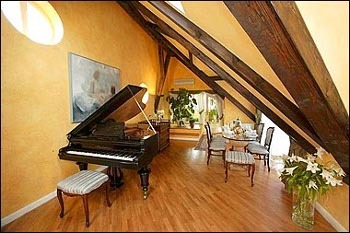 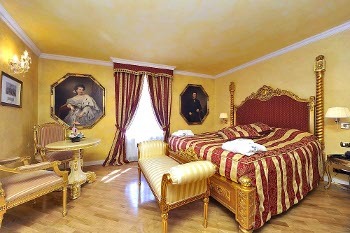 Mozart - no.208 - bedroom with a double bed and sitting area, kitchenette, bathroom with bath tub and toilet. 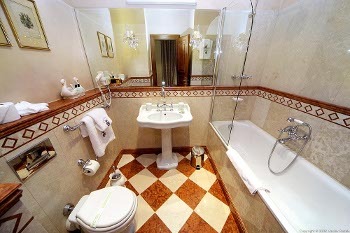 Casanova - no.209 - bedroom with two twin beds, fireplace and sitting area, bathroom with bath tub, bidet and toilet. 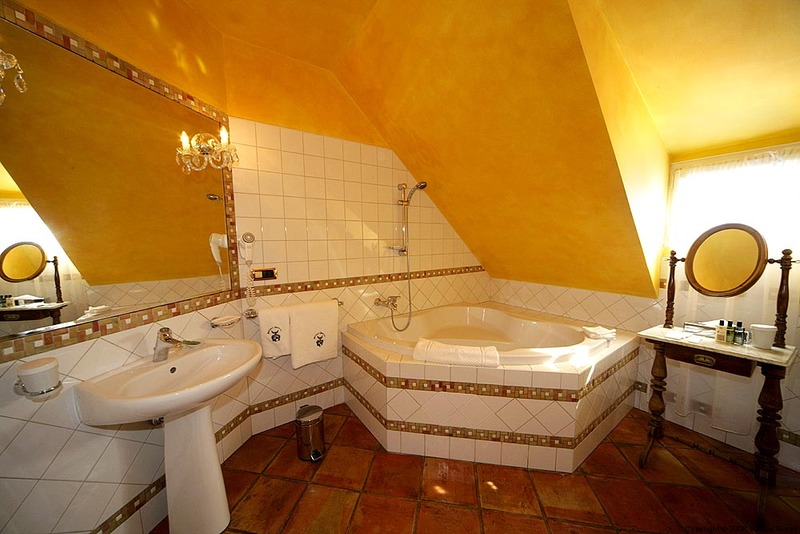 Karlstein - no.312 - bedroom with a double bed and sitting area, kitchenette, bathroom with bath tub and toilet. Eliska Premyslovna - no.314 - bedroom with a double bed and sitting area, kitchenette, bathroom with bath tub and toilet. 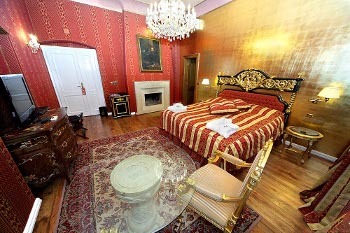 Tycho de Brahe - no.106 - bedroom with a double bed, living room with sofabed, bathroom with bath tub, bidet and toilet. 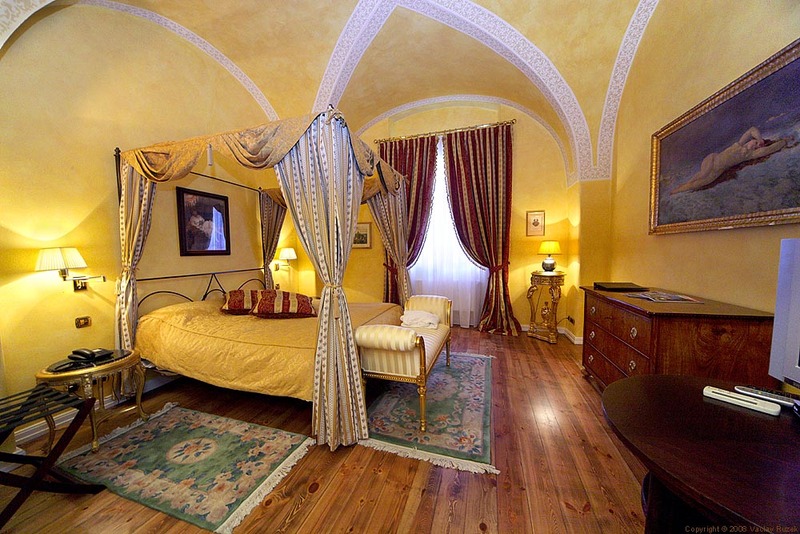 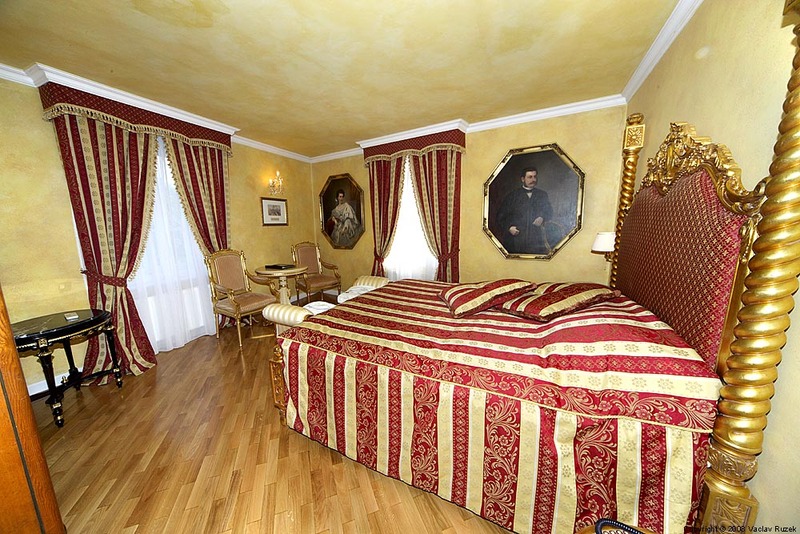 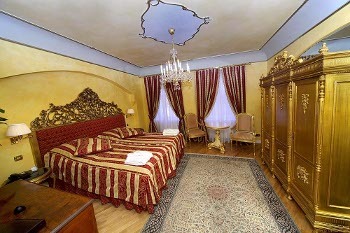 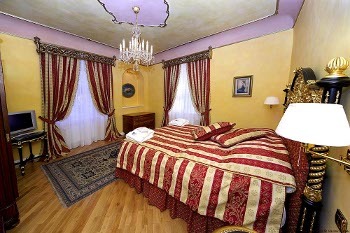 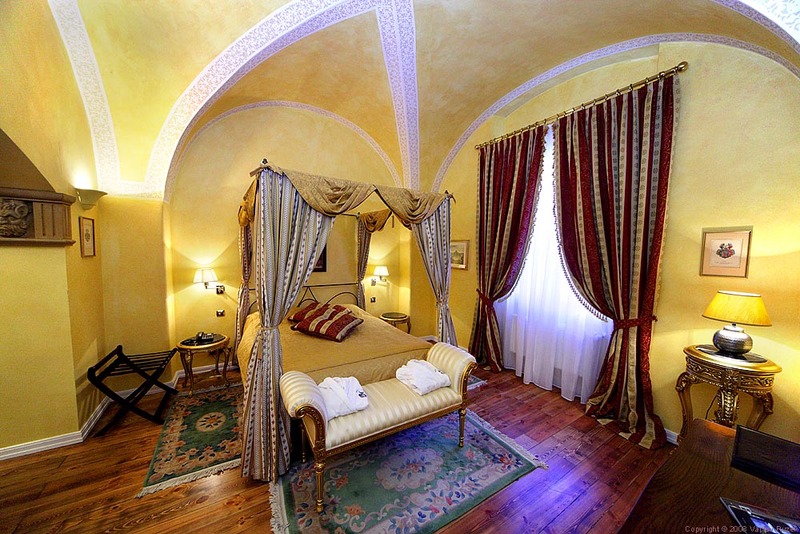 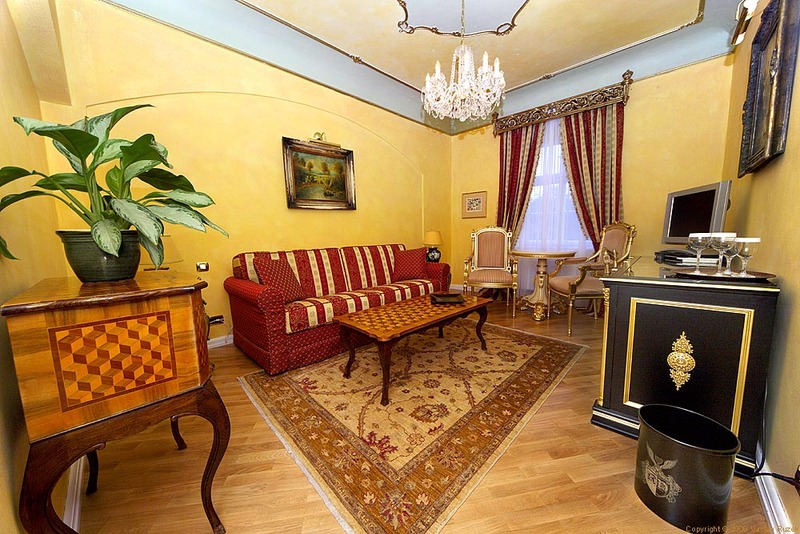 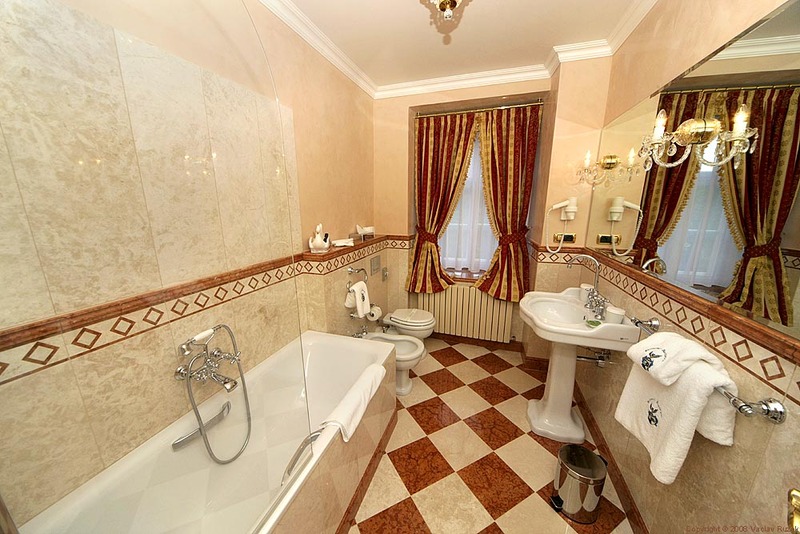 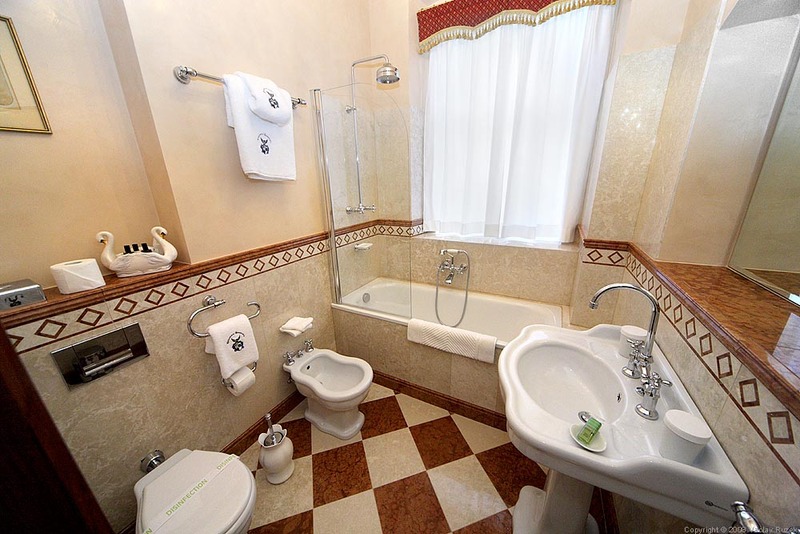 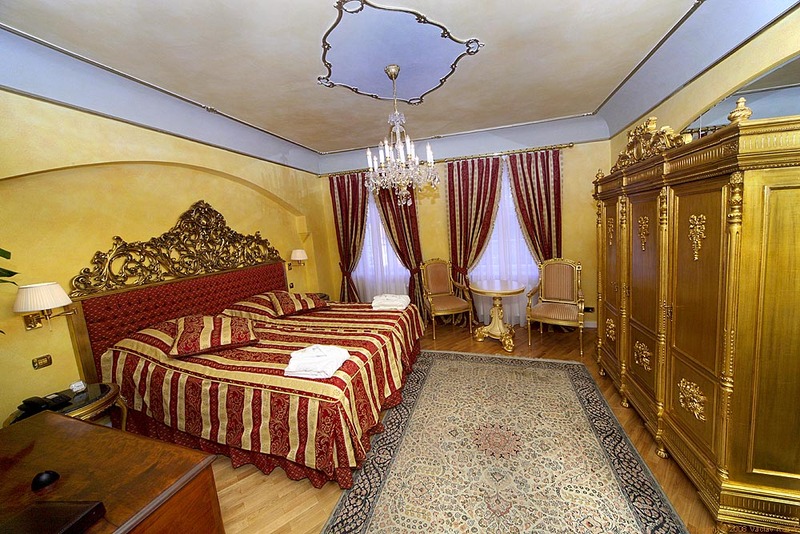 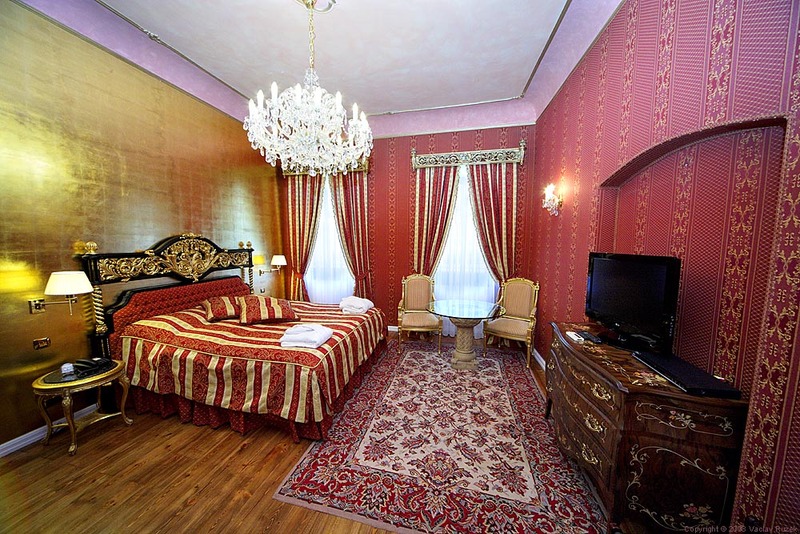 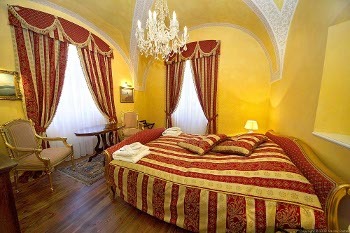 Joseph II - no.210 - bedroom with a double bed, living room with sofabed, bathroom with bath tub, bidet and toilet. 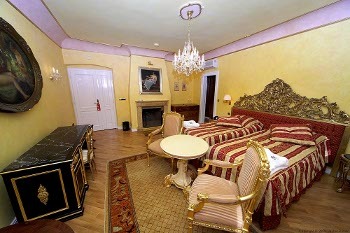 Blanka from Valois - no.311 - bedroom with a double bed, living room with sofabed, bathroom with bath tub. bedroom with a queen size double bed 160x200cm, kitchenette, marble bathroom with bath tub and toilet, air-condition, parquet floors, LCD Sat TV, DVD & CD player, high speed internet access, safe, for 2 persons, 36 sqm / 390 sqft, located on the third floor. 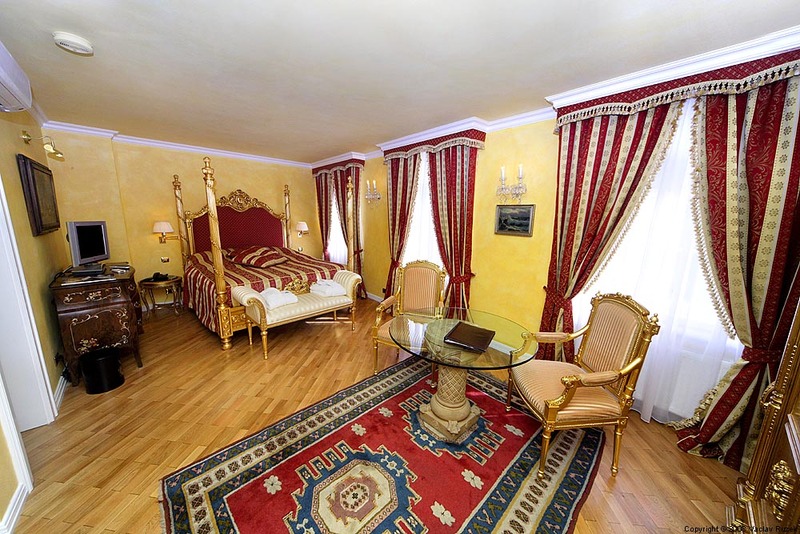 bedroom with a queen size double bed 160x200cm, kitchenette, marble bathroom with bath tub and toilet, air-condition, parquet floors, LCD Sat TV, DVD & CD player, high speed internet access, safe, for 2 persons, 32 sqm / 345 sqft, located on the second floor. bedroom with two twin beds 90x200cm and fireplace, marble bathroom with bath tub, bidet and toilet, air-condition, parquet floors, LCD Sat TV, DVD & CD player, high speed internet access, safe, for 2 persons, 37 sqm / 396 sqft, located on the second floor. bedroom with two twin beds 90x200cm, marble bathroom with bath tub, bidet and toilet, air-condition, parquet floors, LCD Sat TV, DVD & CD player, high speed internet access, safe, for 2 persons, 33 sqm / 355 sqft, located on the second floor. 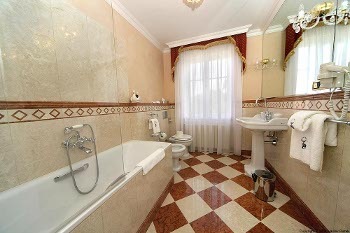 bedroom with a king size double bed 180x200cm, marble bathroom with bath tub, bidet and toilet, air-condition, parquet floors, LCD Sat TV, DVD & CD player, high speed internet access, safe, for 2 persons, 36 sqm / 385 sqft, located on the first floor. 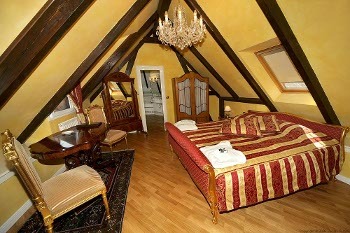 attic bedroom with a queen size double bed 160x200cm and view of Prague Castle, marble bathroom with shower, bidet and toilet, common living room and kitchen with the second deluxe room, air-condition, minibar, parquet floors, LCD Sat TV, DVD & CD player, high speed internet access, safe, for 2 persons, 24 sqm / 257 sqft, located on the fourth floor.Can be connected with the second Deluxe Room to form a largest two-storeyed attic apartment with 2 bedrooms, 2 bathrooms, living room and kitchen for up to 5 persons. attic bedroom with a queen size double bed 160x200cm, large marble bathroom with shower, bidet and toilet, common living room and kitchen with the second deluxe room, air-condition, minibar, parquet floors, LCD Sat TV, DVD & CD player, high speed internet access, safe, for 2 persons, 32 sqm / 347 sqft, located on the fourth floor. 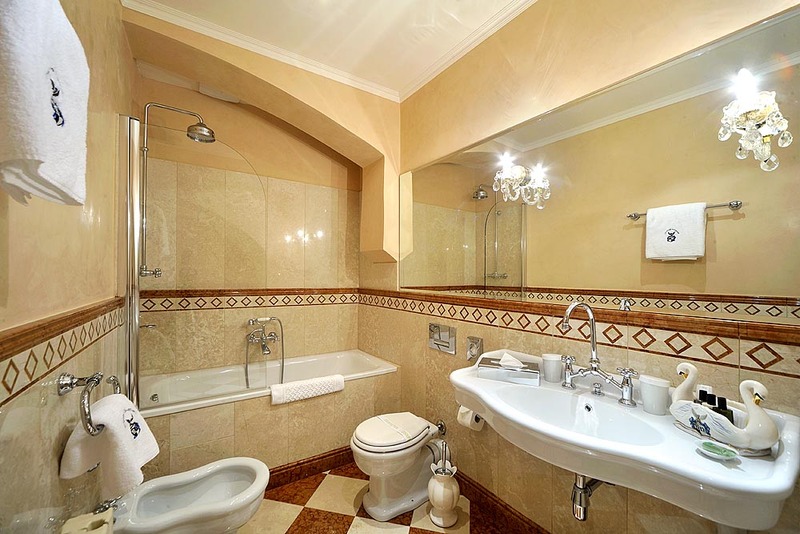 Can be connected with the second Deluxe Room to form a largest two-storeyed attic apartment with 2 bedrooms, 2 bathrooms, living room and kitchen for up to 5 persons. 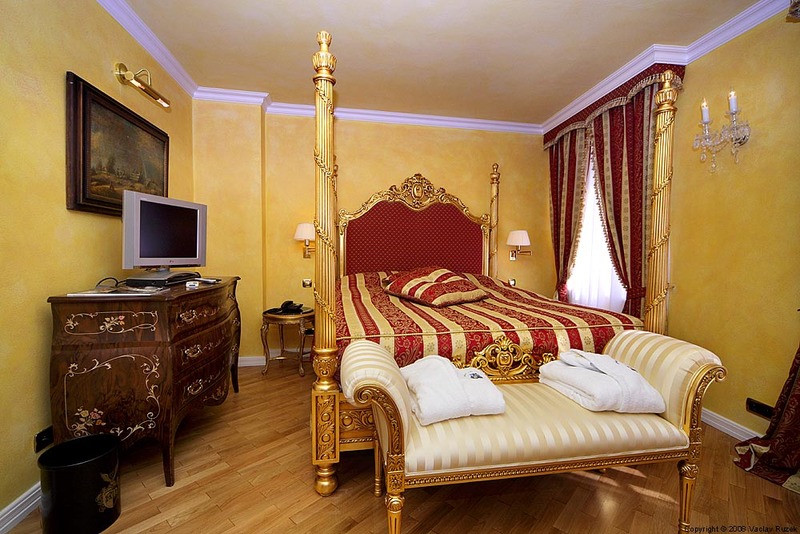 bedroom with a queen size double bed 160x200cm, living room with couch convertible to extra bed 150x160cm, marble bathroom with bath tub, bidet and toilet, air-condition, parquet floors, LCD Sat TV, DVD & CD player, high speed internet access, safe, for up to 4 persons, 44 sqm / 477 sqft, located on the second floor. bedroom with a queen size double bed 160x200cm, living room with couch convertible to extra bed 150x160cm, marble bathroom with bath tub, bidet and toilet, air-condition, parquet floors, LCD Sat TV, DVD & CD player, high speed internet access, safe, for up to 4 persons, 45 sqm / 490 sqft, located on the third floor. 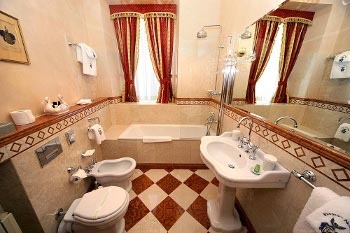 bedroom with a queen size double bed 160x200cm, living room with couch convertible to extra bed 150x160cm, marble bathroom with bath tub, bidet and toilet, air-condition, parquet floors, LCD Sat TV, DVD & CD player, high speed internet access, safe, for up to 4 persons, 42 sqm / 455 sqft, located on the first floor. 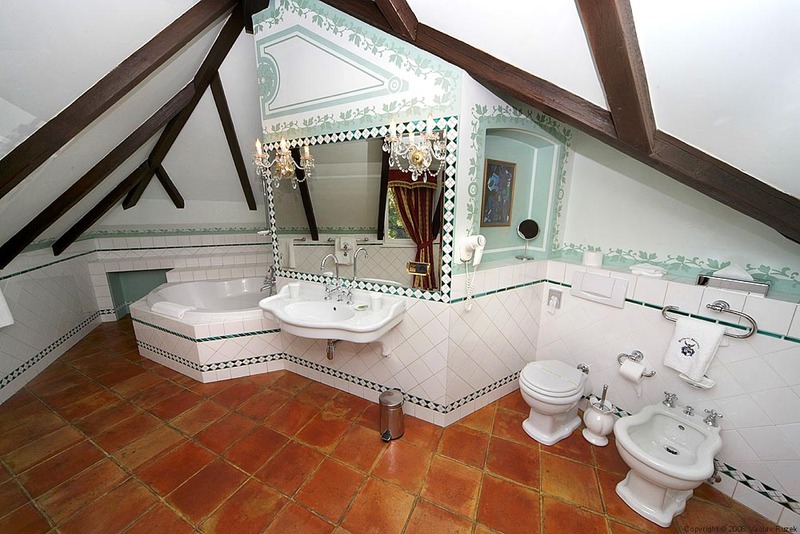 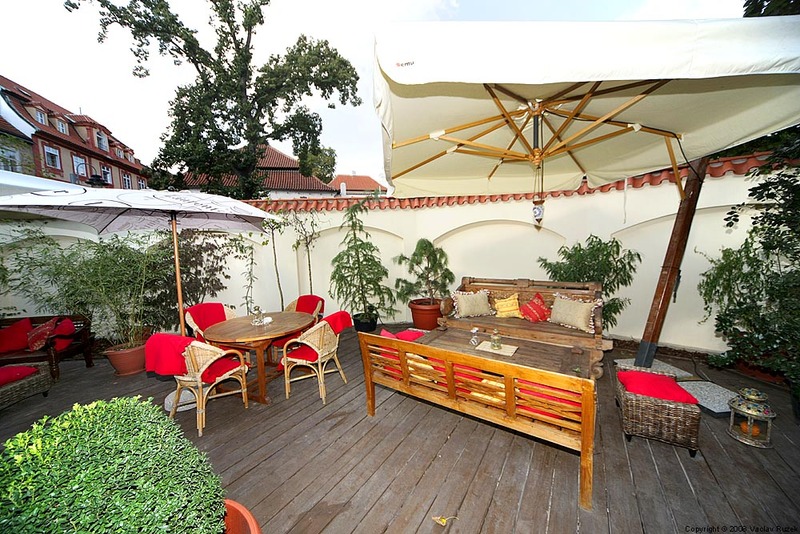 an exclusive largest attic apartment, special for its architectural style, including: bedroom with a queen size double bed 160x200cm, living room with a view over Mala Strana and Prague Castle and couch convertible to extra bed 150x160cm, marble bathroom with bath tub, bidet and toilet, another separate toilet, balcony, grand piano, air-condition, parquet floors, LCD Sat TV, DVD & CD player, high speed internet access, safe, for up to 4 persons, 82 sqm / 886 sqft, located on the fourth floor. 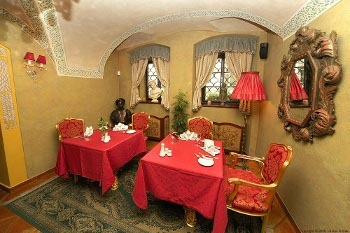 At the end of the 16th century Prague became the center of occultism. 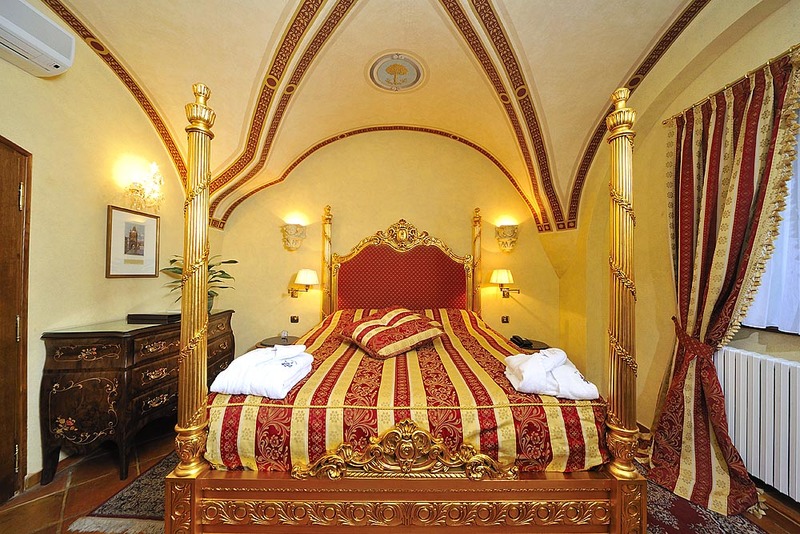 The eccentric Emperor Rudolph II brought in the spirit of the late Renaissance through his passion for mysterious arts and science. 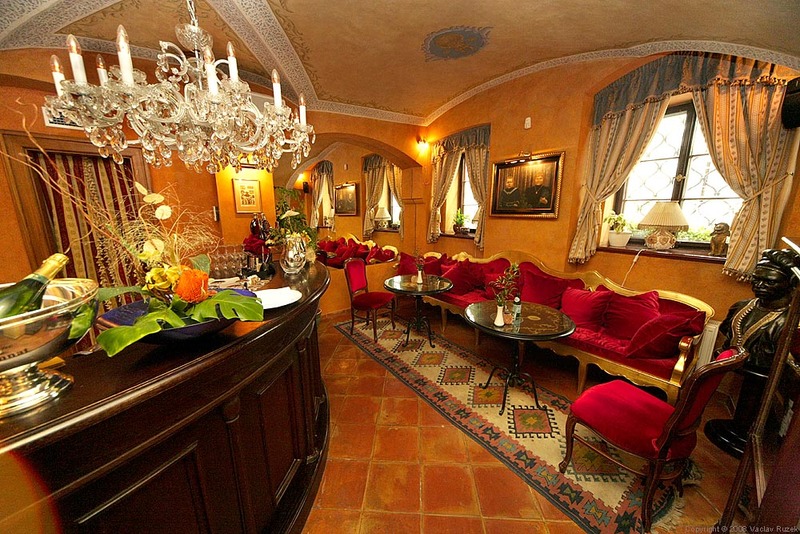 Many alchemists from across Europe came to Prague to enjoy the generous patronage of the Imperial court. 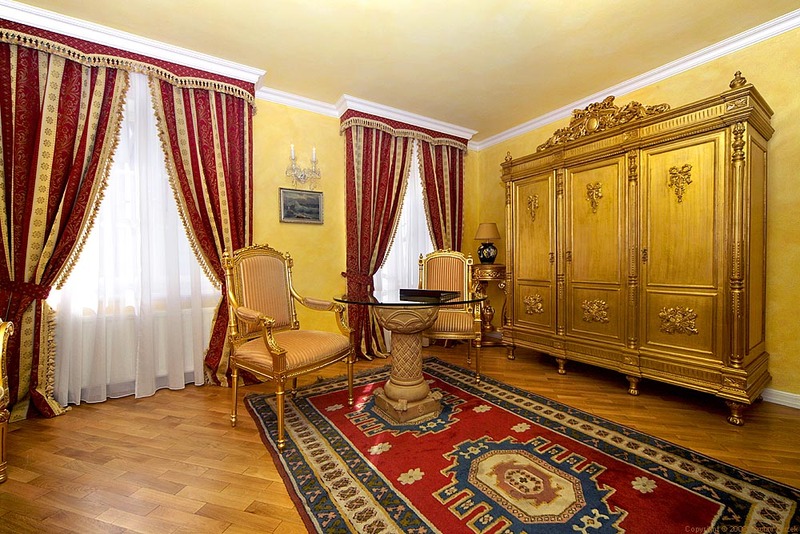 The obsessed Rudolph II employed more than 200 alchemists and charlatans in the hope of discovering the secret formula for converting base metals into gold. Despite no apparent results up to now, the challenging research still goes on, mostly in our kitchen. A relaxing garden part of the restaurant is opened in the summer. 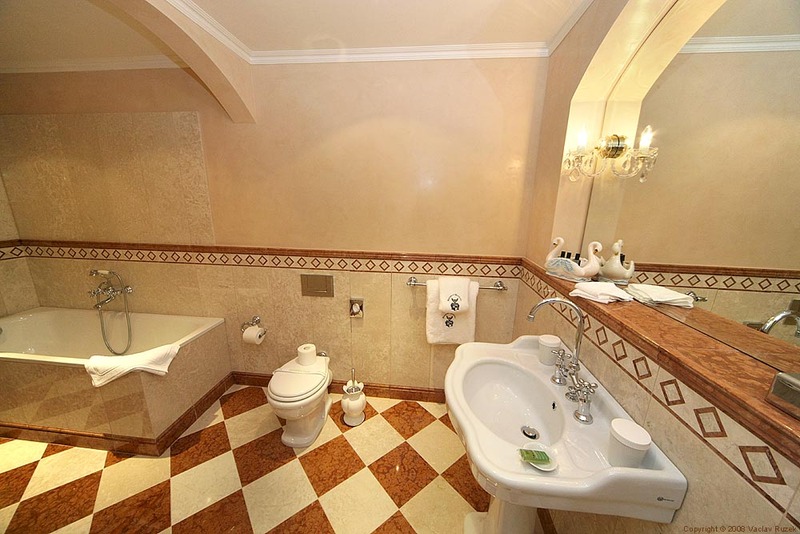 A tranquil oasis dedicated to well-being, the finest luxury spa offers restful rejuvenation in unrivalled privacy and comfort, combining exclusive pampering treatments with extraordinary design elements. 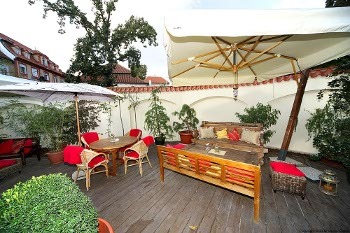 The guests can enjoy a variety of massages, body scrubs, body wraps and bathing rituals provided by a gracious team of Balinese masseuses. 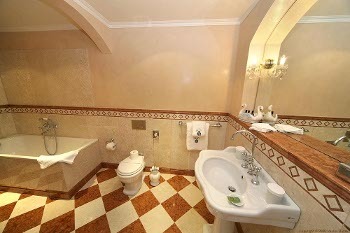 The Spa also features a spacious suite specially designed for couples wishing to share their romantic experience. 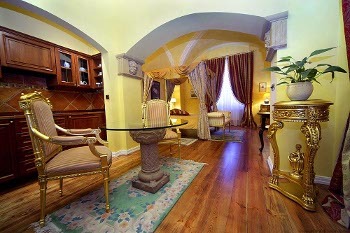 We offer 10% discount for reservations prepaid 3 days and more in advance - rate "AP" (Advance Purchase). 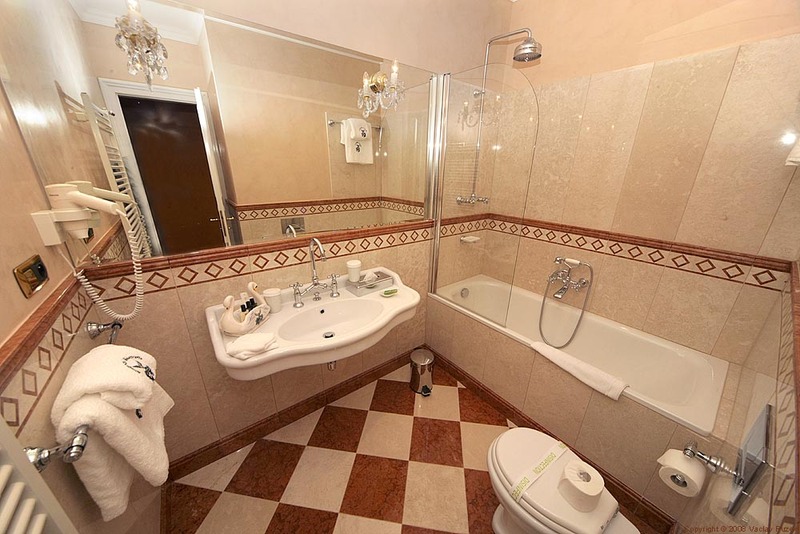 Prices include use of internet, complimentary use of our health club as well as free entrance to the health club in our sister hotel Alchymist (incl.swimming pool, 5 min.by walk) and all taxes, but dont include breakfast. 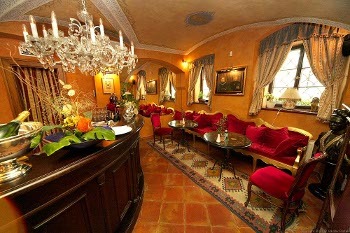 The price for the breakfast is 25,- EUR per 2 persons. From 3 night stays we offer free upgrades, transfers, discounts and other benefits, please ask us for a quote.